I couldn't finish it. This doesn't happen very often. Honest. And I'm a huge fan of Ms. King's Mary Russell series. I read The Beekeeper's Apprentice and have been waiting to read the rest until I have them all so there are no gaps in my enjoyment. But I thought I'd check out the Kate Martinelli series and what better place to start than with a Holmes-related story. I just couldn't hang with it. For my taste, the setup took too long, with way too much detail about practically everything, which bogged down the pace. After 100 pages I set it aside to finish my Connelly project. When I came back to it, I read another 40 pages and gave up. My apologies to Ms. King. I really wanted to like it. If it's any consolation, I'm raring to go on the Mary Russell books. So, a few months later I decided to give the Casey Martinelli series one more go, this time starting at the beginning with A Grave Talent. This moved at a much more satisfactory pace, but I didn't find myself itching to get back to it. In fact, I found myself doing other things to avoid reading it. When at page 140 out of 340 I thought I had figured out the big reveal, I skipped to the back and read a chapter or so to confirm it. I was half right. I'd figured out who the murderer was, just not who he was posing as. So, I figured no need to keep reading Martinelli. I'll stick with the Mary Russell series. Of course, YMMV. I'm only four books into his large body of work, but one thing is clear about Joe R. Lansdale. He's a brilliant writer. Vivid images, trenchant metaphors, visceral writing, penetrating characters, outrageous circumstances, sardonic humor. I've read one title in the Hap and Leonard series, Mucho Mojo. It's well-paced, clever, touching, compelling. 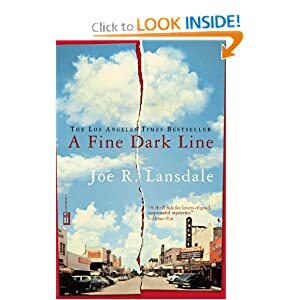 A Fine Dark Line is an excellent coming of age story. Then there is Freezer Burn, where I documented some of his more clever constructions, and now Sanctified and Chicken Fried, a collection of shorter works. All brilliantly written. So what's not to like? The latter two books illustrate where Mr. Lansdale and I part ways. Perhaps my background, my childhood, sets me up to look for the better angels of our nature, to find hope or redemption. Whatever the case may be, stories that chronicle the depravity of man don't resonate with me. And in these last two books are impressively written stories that, for the most part, depict man at his worst, stories that seem say: This is what we are. This is what is. I don't deny that such is the reality for some segments of the population. I have no way of knowing the percentages. Are there more like Joe or more like me? Don't know and it doesn't really matter. But I have to question how much time I want to spend dogpaddling in the muck, regardless of the brilliance. I'll read the Lansdale books I have now and focus on the Hap and Leonard series and see where it takes me. Proceed at your own advisement. YMMV. The other Lansdale novels I've read have been a little wacky. This one was serious, a coming of age story, and very nicely done. Set in the late 50s in a small East Texas town. Lansdale has a way with a phrase, although this book as not as chockfull of the catchy little zingers as the others I've read. This book pegged the Elliptical Test. I was usually surprised that the 40 minutes had passed and sat down with the book during my cool down to finish the chapter. That tells you something right there. Lansdale has been writing for decades and has over 30 books out. And he's dang good. And he's a Texan. And I just heard about him last year. How does that happen? Another book loaned by The Learned One. Good writing, good story, good ending, although I suspected the ending early, saw it coming for sure on page 225 out of 400 pages. The only question left about the ending at that point was not "what happens" but "how does it happen." I found the complete cluelessness of the father incredible, and in the first 100 or so pages I got a little weary of some of the diatribes and the telling instead of showing, but it got better as things went on and I actually stayed up past 3 am to finish it, which tells you something about the intensity at the end. Shriver paints a chilling portrait of the first 16 years of the life of a sociopathic genius as seen through the eyes of his ambitious and ambivalent mother. Mike Mason does not disappoint, particularly with his non-fiction. There are moments when he recounted experiences raising his daughter that I thought, "Come on, Mike, who is in charge, here?" But for the most part he delivers the zingers for which one reads Mike Mason. One need not have children to benefit from this book.